BEIJING, July12 (ChinaMil) -- Vice Chairman of China's Central Military Commission (CMC) Xu Qiliang met Teodoro Nguema Obiang Mangue, vice president of Equatorial Guinea, in Beijing on Wednesday morning. Xu said that in recent years, with the personal concern and promotion of the heads of state of the two countries, the relations between China and Equatorial Guinea have witnessed a significant development, and have become a fine example of South-South cooperation featuring mutual respect and mutual trust, reciprocal support and mutual benefit, as well as sincerity and friendship. Equatorial Guinean military plays an important role in safeguarding the peace and stability of the Gulf of Guinean, Xu said. Chinese military attaches great importance to improving relations with Equatorial Guinean military and is willing to strengthen exchange and cooperation in areas of young officers training, college education, troops' training and maritime safety, so as to develop the military-to-military relations compatible with the comprehensive cooperative partnership between the two countries, Xu said. Equatorial Guinean thanks China for its long-term support and assistance, and is willing to make joint efforts with China to establish more solid and closer bilateral relations, Mangue said. 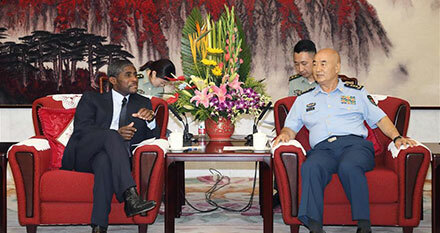 Equatorial Guinea pays high attention to strengthening military cooperation with China, Mangue said. He hoped both sides will deepen cooperation to push forward relations between the two militaries. Vice Minister of China's Ministry of Foreign Affairs Zhang Ming, and Major General Shao Yuanming, who is deputy chief of the CMC's Joint Staff Department, attended the meeting.